for 320 teachers across the U.S.
in teaching climate change education for 2 years. reductions in theit energy use. ClimateChangeEducation.org for use by teachers. Ocean Acidification & Solutions. Making your own. 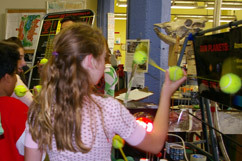 May 1-2, 2010 Pre-registration, postmarked by April 26, is required. Presentations by JPL and local scientists, geographers, and planners. The bulk of the conference is presentations, not workshop-type activities. Instructional materials and resources will be shared. Registration fee: $45. 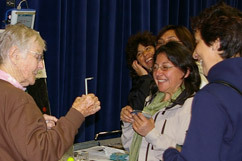 hands-on science demos & curriculum presentations. Copyright ©2011 ClimateChangeEducation.Org. Photos all rights reserved.